Our first full day in the Pacific Northwest. One thing we first noticed was the weather. This was January, and yet it was 45 degrees out. Three years later, I love the fact that it’s so warm all Winter. I do miss snow, and I think I’m becoming less able to deal with cold, but it’s nice to not have to go through the full bundle up process every time you go out. I didn’t grow up walking uphill to school both ways, but my house was in between two small hills. So I did walk West up a small hill to get to my bus stop. In the middle of Winter, the temperature hung in the single digits, especially in the morning when we had to walk to the bus stop. I remember the hill shielded me from the brunt of the cold, because as soon as I crested it, every morning, the wind would hit me and make my eyes tear up. But, here in Seattle, there’s none of that nonsense. 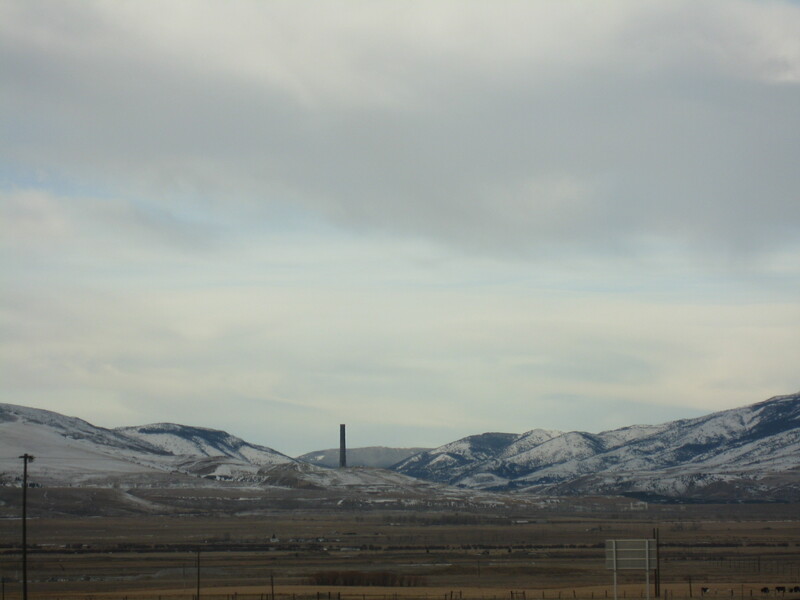 Soon after we left Butte, MT, I noticed something tall and dark in the distance. I90 was taking us toward the mountains, and toward this tall dark thing. We could see it for miles, and it seemed like it was in our view for hours. At some point, the road curved, and it finally started to drop away. I took a picture of a nearby exit sign, and later looked it up. 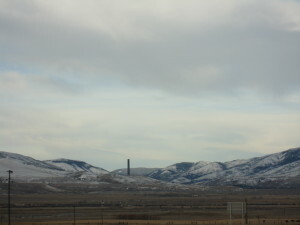 It is the Anaconda Smelter Stack. It stands alone in tribute to an America that was once growing faster than it could keep up, and building things at a record pace. We hit quite a bit of snow in Indiana, and again in Minnesota and a bit of South Dakota. The bad weather seemed to clear up as we drove over the Missouri River, and was beautiful for the rest of the trip. Yesterday all of our National Park pictures had beautiful blue skies in them. Today as we trekked through the end of South Dakota, cut a corner of Wyoming, and started the slog through Montana, the weather continued to be beautiful. Murdo. A small oasis in a sea of flat snow fields as far as the eye can see. We arrived last night, and ate at what seemed to be the only restaurant in town. I think everyone else in there was a local. In the morning, I called the Minuteman Missile National Park. The website says you can get a tour of the missile control bunker, but it’s very limited, so check before you go. The Ranger was incredibly nice, and said there was space. The best part about this? We were in the Central Time Zone, and the National Park was in the Mountain Time Zone. I was calling at 9am my time, for a tour that would start at 9am his time. This day was both my most favorite and my least favorite. We left Minneapolis and drove south to reconnect with I90, then we continued our journey into the West. The land was flat – just fields of snow for miles, with windmills or factories occasionally interrupting the nothingness. I love road trips and I love exploring new places, so this was a good day. I had never been this far West, except for one quick weekend in Oklahoma and a weekish in California. And I had certainly never been up here, in The West. It was exhilarating. We stayed with good friends while in Minneapolis, and January 23rd was our rest and hang out day. Minneapolis is a small jaunt north of I90, so technically not on the way, but it was worth it to see good people. And what’s an extra 60 miles in a 2700 mile journey? That morning, as we walked out of the apartment, we realized we had left our half empty gallon of Turkey Hill Green Tea in the car. The night before, in South Bend, we had remembered it. This time, we had not. It was frozen. But the container was plastic and not full, so thankfully it did not spill on all of our stuff. It’s funny what you remember. I don’t remember what we ate for breakfast or what we talked about that morning. But I remember the parking lot had a thin layer of snow and ice, and so did the streets. I remember that we turned right out of the hotel parking lot when we left. We drove for five minutes until we crossed into Michigan. Then we turned around, drove five minutes back to the hotel, and got on I90 to continue our journey. I love lists, and I love completing things. I have a map and a list of where I’ve been and where I want to go. And, like all passionate travelers, my list has rules about what counts and does not count. If I stop over in an airport, that doesn’t count. Saying you’ve been somewhere means you’ve actually been there. My weekend in Oklahoma does count, for example, but barely. The night before we, with the help of a good friend and my wife’s mother, cleaned out our apartment and turned in the keys. We threw everything into the car, and headed to the hotel for the night. In the morning we said our goodbyes and drove West on the Penna Turnpike. Yes, all of the states have had two-letter abbreviations for a while, but some of the PA Turnpike signs still say Penna. And almost all of the signs are large keystones.